Homebuyers are finding it advantageous to make the move to Tomball for quick access to business centers and communities throughout Houston. This benefit comes into focus especially with new homes in Rosehill Reserve. Located in Tomball off 2920 between Mueschke Road and Rosehill Road, the community is perfectly positioned for easy access to the Grand Parkway as well as Highway 249. Residents will see Hwy. 249 take shape in Montgomery County this year—a long-awaited thoroughfare for Precinct 2 that could ease traffic congestion, provide economic development opportunities and afford drivers greater access to the region, Commissioner Charlie Riley said. Crews are working in Harris, Montgomery and Grimes counties to extend Hwy. 249 from Tomball to Hwy. 105 in Navasota—a project estimated to cost about $662 million in total. Construction on three of the remaining four parts of the project—including the Montgomery County portion—is expected to ramp up in 2018 and be complete by summer 2020, transportation officials said. The Texas Department of Transportation and contractor Williams Brothers Construction Company Inc. LLC began clearing land in December for TxDOT’s first segment of the Hwy. 249 extension, which stretches from FM 1774 in Pinehurst to FM 1774 in Todd Mission, said Eric Bennett, TxDOT’s Hwy. 249 project manager. 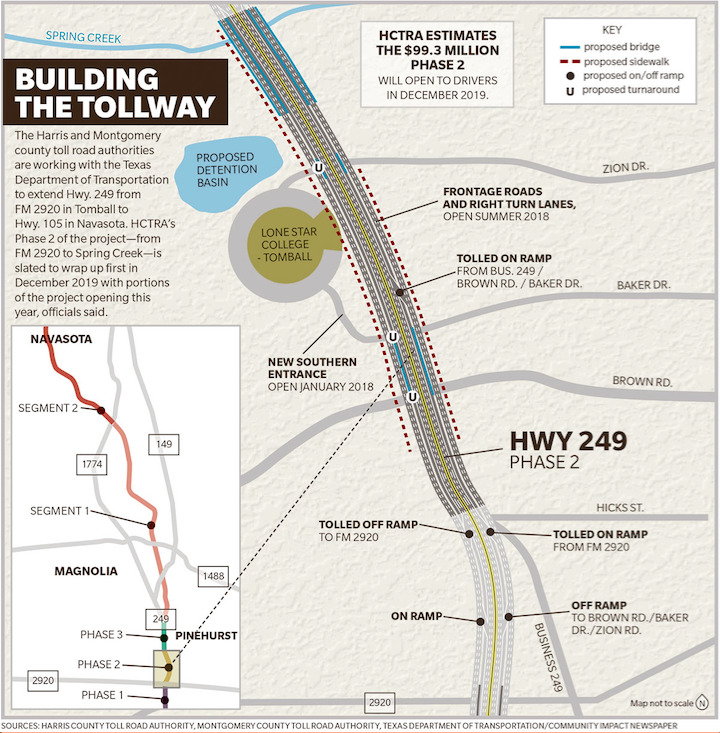 Bennett said construction activity will increase in January, nearly a year after Harris County Toll Road Authority crews began work on Phase 2 of the Tomball Tollway—the tolled portion of Hwy. 249 in Harris County. Parts of the project will open this year. New homes in Rosehill Reserve are just minutes from everything you need. Residents get to savor the perfect balance between getting away and quickly getting to just about anywhere they want to go – straightaway. View our inventory of new homes.